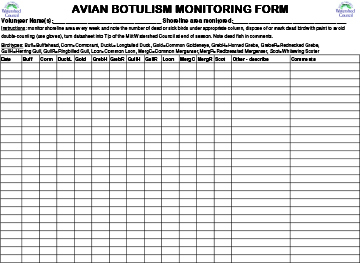 Each fall, Tip of the Mitt Watershed Council hosts a free volunteer avian botulism monitoring training. Shoreline property owners on Lake Michigan and Little Traverse Bay, as well as beach walkers in Charlevoix and Emmet County are invited to learn more about avian botulism outbreaks and how they can assist in monitoring the bird die-off this fall. For information about our next training and monitoring season, please call Tip of the Mitt Watershed Council at 231-347-1181 or e-mail caroline@watershedcouncil.org. Loons, scoters, grebes, and gulls are among thousands of birds found dead on the Lake Michigan shoreline in recent years. 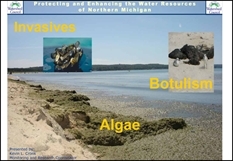 Type E botulism has been confirmed as the cause of death by the Michigan Department of Natural Resources (MDNR) in bird carcasses collected from numerous locations along the Lake Michigan shoreline. Each fall, reports of dead birds in Charlevoix and Emmet Counties are phoned in to the Tip of the Mitt Watershed Council office, where staff respond and work with Michigan Sea Grant and the MDNR to track bird and fish fatalities in affected areas. According to the MDNR, botulism is a "paralytic condition brought on by the consumption of a naturally occurring toxin produced by the bacterium Clostridium botulinum." Type E botulism is found in anaerobic (or low oxygen) environments, such as lake sediments, where it is taken in by fish. Affected fish experience a loss of equilibrium and exhibit unusual behavior such as swimming erratically or floating near the surface. These fish become easy targets and birds feeding on dead or dying fish are in turn affected. Great Lakes fish that have been affected by botulism include freshwater drum, smallmouth bass, rock bass, stonecats, round gobies, channel catfish, alewives and sturgeon. 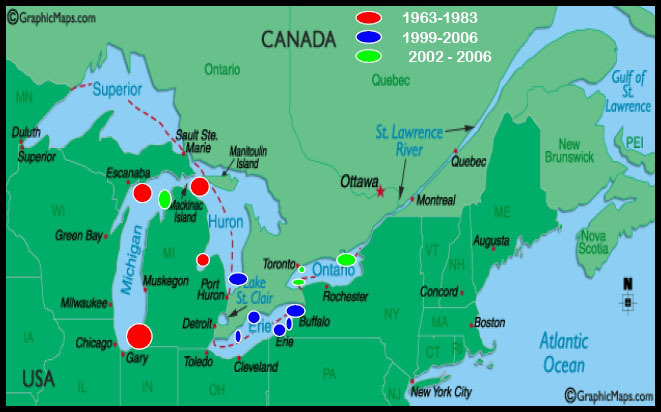 Avian botulism was first documented in the Great Lakes in the 1960's, but there were no confirmed cases in Lake Michigan between 1983 and 2006. Following this decades-long hiatus, botulism returned with vehemence, taking a heavy toll on migratory waterfowl with nearly 3000 dead birds reported from just Sleeping Bear Dunes National Park in 2006 and an estimated 8,000 dead birds turning up on the northern Lake Michigan shoreline in 2007. During the relatively cool summers of 2008 and 2009 with Great Lakes’ water levels rising slightly, the incidence of avian botulism dropped dramatically and few dead birds were reported. Unfortunately, the quiet was not to last. Scores of dead birds began to appear again on the northern shores of Lake Michigan in the fall of 2010, following a summer of warmer temperatures and a return to lower water levels. Although uncertain, recent outbreaks may be linked to lake ecosystem disruptions caused by low lake levels and aquatic invasive species, such as the zebra mussel and round goby. The bird fatalities also occur in waves, depending upon environmental conditions. Outbreaks pose little danger to people since most bird species affected are not typically eaten by people and thorough cooking destroys the toxin. However everyone should take precautions if handling dead birds by using disposable gloves and washing thoroughly afterward. Anglers and hunters should avoid fish and waterfowl that are easy pickings due to strange behavior, such as lethargy and erratic swimming. Assist with monitoring efforts. Contact Caroline Keson at 231-347-1181 to volunteer and help track the number and type of birds. Botulism has been identified as a problem for fish and birds in Lakes Ontario, Erie, and Michigan. 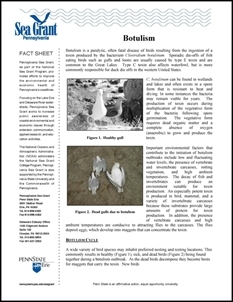 For more information about avian botulism in the Great Lakes visit the links below. Since 2007, Tip of the Mitt Watershed Council has taken the lead to coordinate avian botulism monitoring in the Northern Lower Peninsula in an effort to better understand the underlying factors contributing to outbreaks. 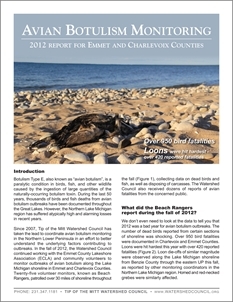 In the fall of 2012, the Watershed Council continued working with the Emmet County Lakeshore association (ECLA) and community volunteers to monitor outbreaks of avian botulism along the Lake Michigan shoreline in Emmet and Charlevoix counties. This is a report of their findings. Powerpoint presentation slides in a pdf format. Tip of the Mitt Watershed Council's presentation on avian botulism. This file is 2MB in size. For more information about the presentation, please contact Dave Edwards at 231-347-1181 or e-mail at davide@watershedcouncil.org. This guide was developed to aid with the field identification of the most common waterbird species implicated in botulism E die-offs on northern Lake Michigan. This fact sheet was modified by Sea Grant Pennsylvania with permission of U.S.G.S. An online tool for the general public and volunteer groups to record environmental and wildlife health events around the Great Lakes. 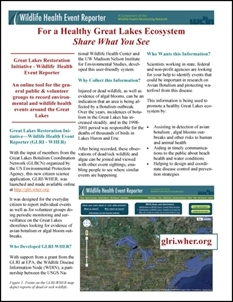 With the input of members from the Great Lakes Botulism Coordination Network (GLBCN) organized by the US Environmental Protection Agency, this new citizen science application, GLRI-WHER, was launched and made available online at http://glri.wher.org. 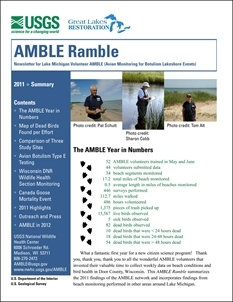 The primary audience for this newsletter is AMBLE (Avian Monitoring for Botulism Lakeshore Events) volunteers. 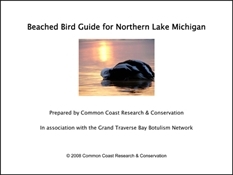 It includes findings with regard to bird mortality and avian botulism along Door County beaches during the summer of 2011. Jenny Chipault by e-mail at AMBLE@usgs.gov or by phone at (608) 270-2473.